For Charles Ahn, it is only a matter of time before a new smartphone can authenticate a fingerprint on a display, rather than under it, thereby vastly improving accuracy. 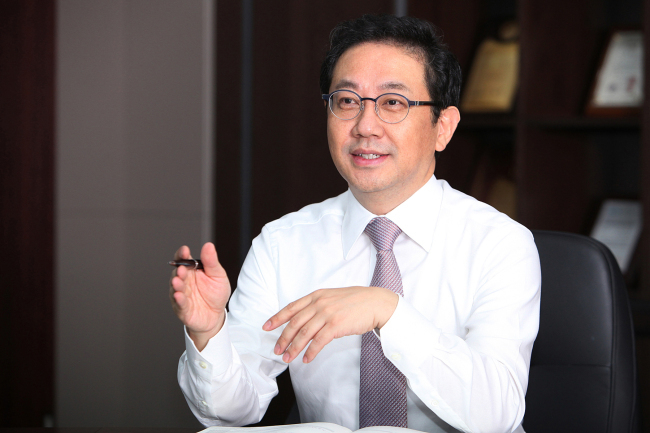 Ahn, chairman and CEO of CrucialTec, a Korea-based biometric solution developer, has been making investments for the development of the company’s patented Display Fingerprint Solution, or DFS, since 2012. “Our technology is fully ready, and we are in talks with the world’s leading display manufacturers to see the first smartphone with the DFS by the first half of next year,” Ahn said in an interview with The Korea Herald at the company’s headquarters in Pangyo, Gyeonggi Province. There is an ongoing race among global smartphone makers to introduce smartphones with the display fingerprint authentication solution, and CrucialTec is at the center of the competition, as it owns the largest number of patents related to the solution and its technologies. Samsung Electronics had attempted to adopt a display fingerprint solution in its flagship Galaxy S8 smartphone early this year, but halted the development due to technological hurdles. Apple has also reportedly given up on the development of a touch sensor IC for the upcoming iPhone 8, which would have enabled both screen touching and fingerprinting on a single display, according to foreign news reports this week. Samsung is reportedly working with Synaptics, a San Hose-based biometrics firm on the new solution, while Apple owns Authentic, which develops such displays. Considering that Samsung and Apple are both struggling to release such smartphones at the moment, the ball is in CrucialTec’s court. CrucialTec was the world’s first to supply its fingerprint solution Biometric TrackPad, known as BTP, to Huawei, Meizu, OPPO, Vivo, Google, MS, Sony, Fujitsu and LG Electronics. It provided the solution to Fujitsu’s Disney smartphone series and Pantech’s Vega LTE-A in 2013, slightly earlier than Apple’s iPhone 5S series. The company’s DFS is based on transparent touch screen pads with a hybrid IC that processes fingerprint authentication and touch screen sensing simultaneously. Other companies are currently developing similar solutions based on opaque IC chips, either with an optical or ultrasonic method, which have lower yields than the DFS, according to Ahn. Since the hybrid IC is placed just under the tempered glass of the smartphone, and right on the display panel, the accuracy of fingerprint authentication and touch screen sensing improves, the CEO explained. By using transparent electrodes, the DFS has reached 90 percent in clearness of viewing the display, which is the same level proven in existing smartphones without the additional display fingerprint solution. CrucialTec’s competitors have developed solutions to place the fingerprint sensor IC under the main display panel, which is comparative to the DFS that shows higher accuracy, according to a company official. “The only remaining challenge is to overcome the glass in order to raise the accuracy of touching and personal authentication by continuing to improve the sensor capabilities,” he added. According to Strategy Analytics, there will be a total of 1.6 billion units of low, mid-end and premium smartphones with fingerprint authentication solutions by 2020, up from 850 million units this year. The company allocates at least 10 percent of its annual revenue for research and development, Ahn said. Last year, the company posted 320 billion won ($282 million) in sales and 8.3 billion won in operating profit. But in the first quarter of 2017, it saw a 7.8 billion won operating loss due to R&D costs, despite 43.3 billion won in quarterly sales. Ahn is currently chairing the Korea Venture Business Association and is part of the presidential committee on job creation. He was formerly a senior researcher on optics at Samsung Electronics.